Ben Vandixhorn hits a forehand. The sophomore will look to collect another win this weekend in NU’s final home matches against Minnesota and Wisconsin. With a packed Big Ten weekend ahead, Northwestern is aiming for success at home against Minnesota on Friday and Wisconsin on Sunday. This weekend’s matches are the last home events and final competitions of the regular season for the Wildcats (9-14, 4-5 Big Ten). The Cats are looking to turn the tide after losing their last three matches, but defeating the No. 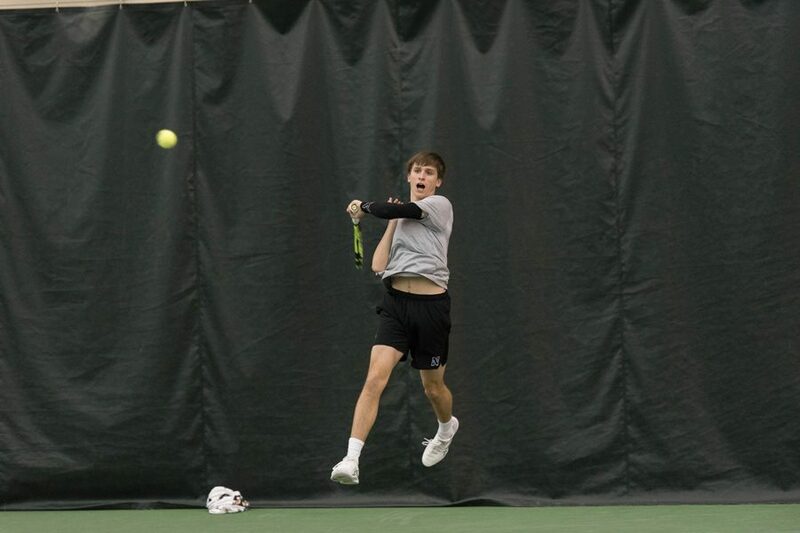 35 Gophers (13-6, 6-2) — a team in which half of the singles players rank in the top-100 for singles — will not be easy. Minnesota’s No. 3 seed, Stefan Milicevic, holds the No. 85 ranking and is set to face NU’s Ben Vandixhorn on Friday. Vandixhorn, a junior, is in his first year playing in a top-three spot in the lineup. He said the elevated position makes competition all the more difficult and bringing his A-game all the more necessary this weekend. For the No. 1 seed slot, sophomore Dominik Starý will challenge No. 95 Felix Corwin. Starý currently holds the No. 122 ranking for singles. Nick Brookes, the No. 2 seed freshman who has a team-high nine victories this season, will face No. 89 Matic Spec, who claimed his seventh-straight victory last weekend for Minnesota versus Michigan State. Doubles is a strong point, however, for the Badgers (12-10, 4-5) with duo Chema Carranza and Josef Dodridge holding the No. 7 ranking. Wisconsin and NU have the same record in the Big Ten, but the Cats notched victories over Indiana and Purdue when the Badgers could not. However, Wisconsin pulled off a win against Penn State, a team NU fell short to last weekend. Coach Arvid Swan stressed the importance of winning the doubles point in order to obtain an overall team victory. He said clinching the doubles point gives NU powerful momentum to finish matches on a high note in singles play.